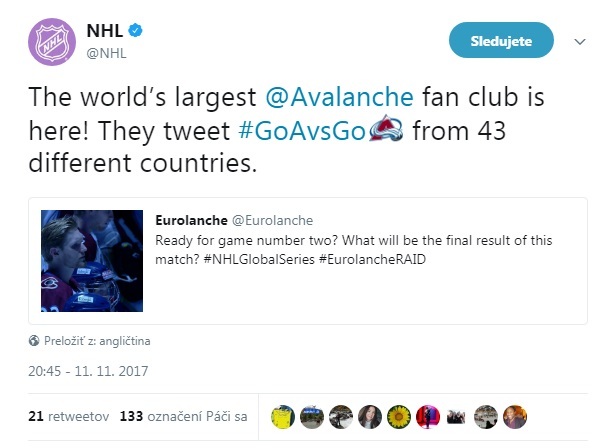 On the day the NHL officially confirmed the 2017 SAP NHL Global Series, the first European and biggest Fan Club of the Colorado Avalanche launched GlobalSeries.Eurolanche.com, a special website which allowed its members to buy tickets for the Avalanche’s two games against the Ottawa Senators among the very first fans. In total, 57 members from 10 countries and two continents took part in Eurolanche’s biggest project to date. Initially, more than 100 members expressed interested in the trip. Ultimately, aside from the previously mentioned 57 fans, dozens of other Eurolanche members travelled to Sweden individually, thanks to which the number of Fan Club members attending both games surpassed 100. Following the league’s official announcement, the event was still several months away from its start. Eurolanche members couldn’t wait. Some knew that the Avs’ two games against the Sens are their first and last chance to see their favorite team play in person. The big Eurolanche Raid 2017 group was eager to finally go to Sweden. How often does it happen that your favorite NHL team comes all the way to Europe? The NHL Global Series was a unique event from the beginning. The Fan Club, as well as the editing staff of Eurolanche.com didn’t want to underestimate such an opportunity and began to prepare in advance. The participants of the Eurolanche Raid 2017 could discuss the event’s schedule, as well as other details in a closed Facebook group. The first weeks following the announcement of the event were mostly about the organization of the Fan Club’s trip. Eurolanche secured game tickets for the Eurolanche Raid 2017 participants among the very first. Booking accommodation followed right after that, as did the booking of plane tickets. The Czech and Slovak participants, who were the biggest regional subgroup among the participants, booked their flights en masse. 24 Fan Club members flew from Prague to Stockholm on the same day on two flights. The rest of the group ventured to Sweden individually from other parts of Europe or the US. The main program of the Eurolanche Raid 2017 began in the evening of Wednesday, November 8 following the arrival of the majority of participants in Stockholm. The Czechoslovak group was so big that the airport shuttle refused to allow them to board the bus without pre-purchased tickets. Such a big group buying tickets from the driver would mean a significant delay. It didn’t matter that the company was noticed about the number of people via an online form beforehand. Following the successful transfer from Arlanda airport and the purchase of subway tickets, a part of the group ended up in an adidas store, from which they kept receiving photos of Avalanche souvenirs from other members. The other part of the group somehow managed to get lost on their way to the store, but managed to board the very next subway and made it to the store shortly afterwards. Sadly, the store didn’t offer much. Some bought t-shirts, some even bought jerseys, but it was nothing like the mass shopping sprees in the style of Eurolanche Invasions. Talking about Eurolanche Invasions, one can’t avoid comparing the events to the one in Sweden. The Eurolanche Raid 2017 was entirely different in all aspects. Such a high number of participants required a different organizational approach. Travelling in a group of almost sixty people would be impossible. This meant that the entire group had to be divided into more groups, some bigger and some smaller, which meant that every little subgroup could organize their own schedule. After we made our way to the center of the city, we had to split up into smaller groups for the first times, as we simply couldn’t find an establishment where the entire group would fit into. The local prizes were quite a shock for us, but it certainly wasn’t unexpected. For example, a big glass of beer cost eight euros. In the Czech Republic and Slovakia, the same brand of beer only costs about 1.5 euros. Different country, different customs. But since we were there, maybe even for the last time, we wanted to soak it all in. On Thursday morning, we made our way to the Ericsson Globe, about a 20-minute commute away from our hotel. The majority of the group took the SkyView lift at the arena, which offered a beautiful overhead view of Stockholm. David Puchovsky and Michal Hezely went to the arena straight away, as both were given media credentials by the NHL. David was given one just to help out at practices, while Michal had accreditation for the entire event, including both games. Being granted media accreditation was one of the biggest achievements in the history of Eurolanche, thanks to which the Fan Club had unlimited access behind the scenes of the event, covering the event and publishing exclusive interviews and news. The quality of the coverage was on a professional level and showed what it would look like if Eurolanche covered the Avs directly in the US in the same manner. The rest of the Eurolanche Raid 2017 group waited for the players following team practice in front of the arena. Sadly, they didn’t meet any players, as the entire Avalanche team was unnecessary hurried into a bus at the VIP entrance behind a fence, through which Fan Club members couldn’t get. There wasn’t even a big crowd, as our members were the only ones there. According to the majority of the group, it was apparent that the Avalanche players sitting in the bus were really happy to see them. In the afternoon, the group made their way to downtown Stockholm, where they visited the cathedral and bought their first souvenirs. Since the weather gradually got worse and all museums began to close for the day, we agreed on an alternative program – to head back to the arena and wait for Peter Forsberg, who held a hockey clinic inside, or to go to a pub or back to the hotel. The big group then split up according to their preference. Sadly, a meeting with Forsberg once again didn’t happen, although it wasn’t far away from happening. Forsberg enquired about Eurolanche, received the book about its first 10 years, but the NHL had different plans with him. He promised a meeting during the next days and got lost in one of the hallways of the arena. We capped off our first evening in Stockholm with a big group dinner with 43 participants of the trip, during which one of the Fan Club members won a Colorado Avalanche jersey from Eurolanche. The following morning, a part of the group went to the Tyranasa national park in the vicinity of Stockholm, where they were stunned by the beautiful Nordic scenery. The other part of the group had a tour of downtown Stockholm in broad daylight. They even saw the first sunrays making their way through all the clouds. More and more fans in Avalanche jerseys or with Avs hats could be seen in the streets of the city. Despite Old Stockholm being a little smaller, it offered a lot of interesting alleys, pompous, as well as humbler buildings and a very distinct atmosphere. Shopping for local souvenirs was also a must. Before lunch, a part of the group waited for Avalanche players in front of their hotel. We agreed on a short meeting with Mikko Rantanen beforehand. The players did in fact arrive, but since they all came at once, the waiting fans lost sight of most of them. Rantanen delighted our group with autographs and group photos. At the same time, we noticed Avalanche President and son of the club’s Owner, Josh Kroenke, leave the hotel. After we introduced ourselves as a “European Fan Club”, he immediately knew that we had to Eurolanche, which only further proved that everyone knows about us. Josh even greeted all our members via video. He also received the book about the Fan Club. In the afternoon, a part of the group went to Vasa, the most famous museum in Sweden named after the gigantic Viking ship displayed in it. The ship sunk in the 17th century and the shipwreck wasretrieved in the 1950s. 90% of the displayed ship is made of original material, which makes it truly unique. Archeologists keep repairing the ship to keep it perfectly preserved. A thorough tour of the museum would take an entire day. It wasn’t just about the ship – there were smaller and bigger expositions, which were all used by the ship’s crew. The museum is a must-visit for every tourist. Other stops of the Eurolanche Raid 2017 groups included the ABBA museum, the royal palace or various open air museums. All participants met at the hotel in the evening, from where they made their way to a subway stop in Old Stockholm. Once there, they met up with about 20 other Colorado Avalanche fans. The goal was simple – an hour-long march to the arena on foot. We informed about the march via all our platforms with the aim of organizing the biggest march of NHL fans in Europe. On the way to the arena, the air was filled with mass chants like “Let’s go Avalanche” or the sound of trumpets. We were an attraction not only for the locals, but for the media as well. NHL.com senior editor Dan Rosen, Swedish daily newspapers Aftonbladet (online and in their printed version) and Expressen (in a live broadcast on their website), and the Czech Nova Sport TV channel all reported about us. The official NHL Twitter account even called us the biggest Colorado Avalanche fan club in the world and also published a video they recorded with us in front of the arena on Instagram. After about an hour, we finally arrived at the arena, where the iconic group photo of Eurolanche members was taken. The group was so big that we couldn’t even fit everyone into it. On Friday evening, it was finally game time, as well as the time to buy souvenirs with the Global Series logo directly in the Ericsson Globe. The souvenirs were selling at a rapid pace and it was fairly common that you had to buy a puck, a pin and a t-shirt at three different stands, because they just didn’t have everything at the same place. Everything interesting was already sold out before the puck was even dropped. Almost everyone from our group was seated behind Varlamov’s net and thus had a really great view. We cheered and enjoyed a very special NHL game in Europe. It’s a real shame how it ultimately ended. We split up into smaller groups on Saturday as well, with some going back to downtown Stockholm, while others made their way to the surroundings of the city. Some even went back to the players’ hotel. Those that kept waiting in the freezing cold outside of the hotel didn’t regret the long wait. Aside from meeting a number of Colorado players or NHL Commissioner Gary Bettman himself, they also finally met Peter Forsberg and Joe Sakic. Forsberg recognized the Eurolanche group, taking a picture with them as the only fans that were present while chanting “Go Avalanche”. Sakic shook the hands of everyone from the group like he was a longtime friend, something which most of the other (mainly Senators) fans standing nearby simply couldn’t believe. We chatted for a while, about which we wrote in another article. The mission was accomplished. We then made our way to the game, but saw the Avalanche lose yet again. The unlucky performance meant the ninth loss in row during a Eurolanche project. This streak began during Invasion IX, the most recent Eurolanche Invasion. Seven out of nine Invasion IX participants were also in the stands at the Globe. For six of them, the Invasion was their very first one, which means that they are yet to witness the Avalanche win a game in person and only saw nine losses. Talk about bad luck. The big Czechoslovak group flew back early in the morning on Sunday. The remainder of the big Eurolanche Raid 2017 group followed shortly after, with a little part of the group staying behind until Monday, November 13. The Eurolanche Raid 2017 became the biggest event in the history of Eurolanche. It was an entirely new experience and the memory of a lifetime for its participants. A sizeable number of Colorado Avalanche fans, as well as the media were made aware of Eurolanche once again. The distribution of the freshly printed book about Eurolanche, which was given to several reporters, Colorado Avalanche players and staff certainly contributed to the Fan Club’s ever-growing popularity, reputation and progress. Forsberg, Sakic and Kroenke also got their copies of the book. The book will also be distributed during the Eurolanche Invasion X in February and March 2018. More information about the book is available at Book.Eurolanche.com. During the NHL Global Series, Eurolanche became the source of exclusive information and published its own original content thanks to the presence of Eurolanche editor Michal Hezely at the arena. Thanks to his work, we showed that while we can openly support the Avalanche as a fan club on one hand, we can provide professional and objective coverage on the other. During the entire NHL Global Series, we published 29 articles and more than 500 tweets about the event. This is why the entire “Swedish week” became the most successful week in Fan Club history. We can only hope that the Colorado Avalanche will get the opportunity for a rematch and will leave Europe with a winning record. Nothing’s impossible, so why couldn’t the team return back to Europe in the future? Attending the Global Series was the experience of a lifetime. One thing was seeing NHL action in person for the very first time, but seeing how the entire event unfolded behind the scenes was truly unique. It felt like an entirely new world – seeing people, whose articles you’ve been reading for years in person and even getting to chat with them. To step into the locker room and to talk with players you’ve been cheering for during all these years. It was unbelievable. It all felt as if Eurolanche truly took the next step to becoming a relevant, professional media outlet. Nobody treated me like I didn’t belong. Quite the contrary – almost everyone I spoke with was fascinated by what the Fan Club achieved during its existence. It was an honor to represent Eurolanche at the event and to help it to grow even more. I truly hope that this will help establish a trend and that we’ll have the chance to report from events like this in the future. I would like to thank Eurolanche President David Puchovsky for giving me this opportunity and for his trust. I would also like to thank everyone I met during those couple of days, for their kindness and their willingness to help. Once again, I think we proved everyone that Eurolanche can be an independent source of information abiding to all the rules of the media world and meeting all the criteria of a relevant media outlet.